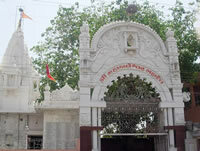 Sankiran Mandir - a famous temple of Lord Ram located at kalawad road before KKV Hall. People are doing Akhand Ram Dhun of Shri Ram in this temple. Yagnas and Special Puja of Lord Rama, Krishna arranged during the year on different spiritual occations. NOTE : This Information is collected from different kind of websites / sources. RajkotCity.Info refuse to accept any claim of loss and or liability by the user of this site. The user of this site is advice to make use of this site at his or her risk. All other logos are trademarks of their respective owners. Copyright © 2015, RajkotCity.Info, Allright Reserved.